The Khön family (Tib. ཁོན་རིགས་, khön rik, Wyl. 'khon rigs) traces its origins to the gods of the realm of Clear Radiance in the Form Realm. Tradition has it that three brothers descended from this realm to our world. Two of them returned, but the youngest, U-sé (Wyl. dbu se) remained and became a ruler. One of his descendants, Yapang Kyé (g.ya' spang skyes), killed a demon called Kyaring Trakmé (skya rings khrag med) and took the demon's wife for his own. As a result of this struggle (Wyl. mkhon) with the demon, thereafter the family became known as Khön. Later, when Shantarakshita was invited to Tibet, Khön Nagendrarakshita was chosen as one of the first seven Tibetans to receive ordination, the so-called 'seven men to be tested'. 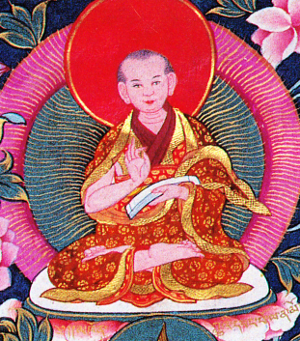 In the eleventh century, Khön Sherab Tsultrim observed the corruption of some Nyingma teachings and became increasingly interested in the teachings of the New Tantras, favouring them over the Ancient Translation practices, such as Yangdak and Vajrakilaya that had been followed by generations of Khön since Nagendrarakshita. He encouraged his younger brother Khön Könchok Gyalpo to seek teachings from Drokmi Lotsawa. In 1073, at the age of forty, Könchok Gyalpo founded Sakya Monastery. This page was last edited on 3 December 2017, at 03:10.